There must be something magical about this tale; why else would so many people spend so many years searching, wrinkling their brows, and stroking their chins in perplexity over the "Legend of the Lost Ark," the "Mysteries of the Great Ararat," or whatever. Other traditions, Jewish and Islamic, also tell Noah's story, but only American Protestants, it seems, are so keen on it that, every few years, some well-heeled evangelical businessman (or, once, an ex-astronaut) will open up his wallet and mount a pseudo-scientific expedition to that heap of Turko-Armenian rock known as "Mt Ararat." The Ark enthusiasts never quit. They are, after all, related to the people who find Jesus on the scorched exteriors of fried food. They have seen--they say--images of the Ark in aerial photographs. They've analyzed fragments of wood. They've done carbon-dating and spectography. They've puzzled and pondered and pretty much done everything they could to find an answer. They are, dare I say it, kind of cuckoo. The shares of Cuckoo Inc., however, are always in a bull market, and the Noah business will never go out of style. Readers who want to confirm this can find a nicely-done history of Ark searches at Wikipedia. My favorites (of course) are the hoaxers, especially George Jammal, a guy in California whose splinter from the Ark turned out to be wood he found on a rail-bed, then aged at home in his oven using various sauces. The image this evokes, that of museum graybeards closely inspecting the artifact, wondering why it would smell faintly of teriyaki, never fails to brighten my day. If, however, you're educated (i.e., an elitist liberal humanist snob), you know that the Genesis flood myth is just one of many in the world, the most famous being that of Gilgamesh. And you know that the "Mt. Ararat" of eastern Turkey has nothing to do with a Mesopotamian flood story. That, and the Real Honest-to-God Landing Place, are what this piece is all about. But, you may object, the mountain in question is still called "Ararat." Why is it called that if it isn't the right one? Because that isn't the mountain's correct name. In fact, it was a European, William of Rubruck, who first stuck that label on it in the 13th century A.D., and it was Europeans thereafter who perpetuated the mistake. The Armenians, then and now, called it Massis, even though, after they became the first officially Christian nation, in 301 A.D., they adopted this imposing peak as the landing-place of Noah. Still, to them it is Massis. This is why, when you drive the streets of south Glendale, California, through the largest concentration of Armenians in the U.S., you see signs on the storefronts saying things like "Massis Laundry," "Massis Bakery," or "Massis Armenian Grocery." A mountain as imposing as that (photo above) needs no Ark legend to justify its status as a national symbol. 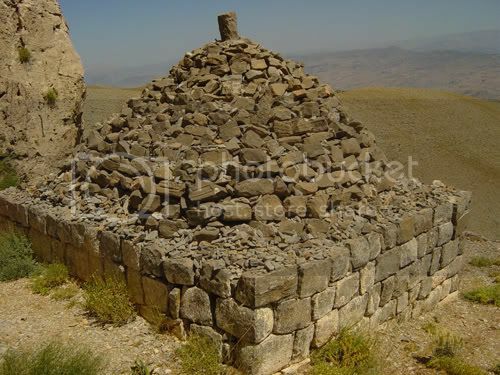 On the first [day here at Judi Dagh] I climbed up into the hills and saw a very ancient fortress on a crag - Assyrian I suspect for there was an Assyrian stele below it. My guides were the Protestant priest, Kas Mattai, and his brother Shim'an...I walked through the oak woods on the mountain sides all the morning with Kas Mattai and it was so wonderfully beautiful that I determined to have another day of it and go to a summit. So yesterday we set off at 4 and climbed through the oak woods for 2 hours and then we came out onto the mountain tops where the snow was still lying in great wreaths and the high mountain flowers were in bloom. There were few of the real alpines - perhaps I wasn't high enough up for them - but the great beauty was the bulbs. But I forgot to tell you what it was I came out to see - I wasn't just taking the air in the mountains, I went up to look at - the Ark. There is a large body of opinion in favour of this [Judi Dagh] having been the place where it alighted and I also belong to this school of thought partly because, you see, I have seen the Ark there and partly because, since the Flood legends are Babylonian, it's far more likely that they chose for their mountain the first high mountain that they knew (which is this Judi Dagh) rather than a place far away in remote Armenia. Right. In other words, the people who set down these legends lived in the plains of Mesopotamia. 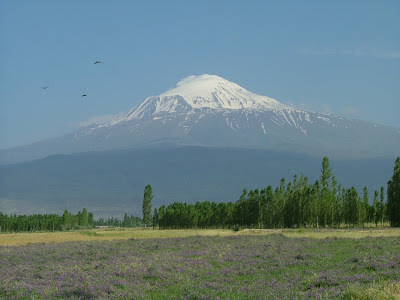 Our present-day "Mt Ararat" was located in a land far away from any that they knew. They did, however, know those sizable ranges which hemmed in the north reaches of the Tigris. And the first and most visible of these was Judi Dagh, Mt. Judi, crowding in against the left bank of the great river. That is why, of the ancient sources, one (the Koran) specifically identifies Judi as the landing place of the Ark, and two others call it "the mountains of the Kardu" and "the mountains of Urartu," which amounts to the same thing. We got up to the Ark about 9 - it was a most wonderful place from which you could see the whole world, though I must confess there isn't much of the Ark left. We stayed [at the Ark] many hours, lunched and slept and looked at the view and breathed the delicious cold air. And at last reluctantly we came down and walked back for a long way over the tops of the hills. And here we had a little adventure. We met some Kurdish shepherds who had brought their flocks up to the top of Judi Dagh in order to avoid paying the sheep tax; and they took us for soldiers and we had to explain the true situation amidst rifle shots. 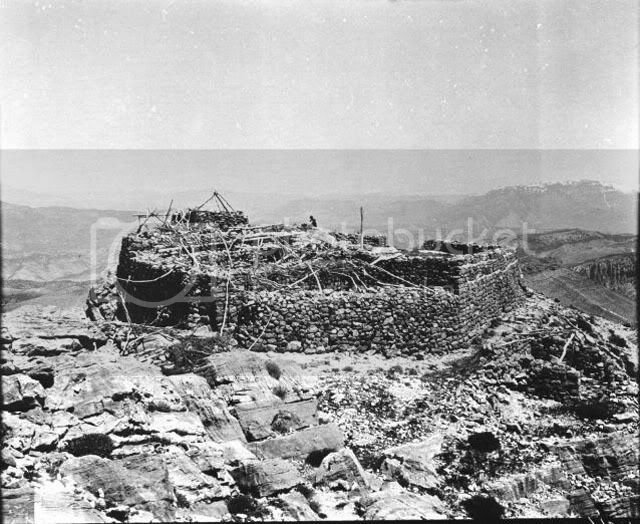 "Noah's grave," according to the guerrillas who took the picture. Mostly it is dust. Certainly redolent of human folly. And probably not The Genuine Article that I promised. Here is the place for a peroration, a summing up of ideas stated and lessons learned. But of course I have few ideas, and the lessons learned are buried somewhere there in the stones. A progressive historian should, I would think, hope for progress somewhere, but we'll not likely find it in the Noah business and in this Ozymandian scene. But then, I post at this site not because I am hopeful for progress; I post because among the people here I've found kindness. I can't believe I made it through almost four decades as a Jew and never heard about this! It really is a literalist thing, and I didn't grow up with biblical literalists. I have to say, though, it almost makes me nervous to have this information out there: in the current environment of fundamentalist intolerance on all sides, the idea of shared holy space (particularly in that part of the world) seems so potentially explosive. Very sad, because I'm sure that ten years ago I would have seen it as having the potential to heal. It doesn't surprise me, really, that a Jew would not know of this. It is American Protestants who make a big deal about this kind of thing. Look at their never-ending quest for the Lost Tribes of Israel, a subject about which the outlandish theories never end. It's not the Jews who get a jones about the Lost Tribes. Americans in general have always gone after the Big Wow discoveries, and Christian fundamentalists in particular run after these chimeras because they need to prove that their Book is the Real Deal and provable as scientific fact. Of course, since it's the King James Bible that is the literal Word of God, they don't dare look too deeply into such matters as "mistakes" in the translations, or the possibility that further discoveries might reveal something about the fallible human beings who wrote these works. 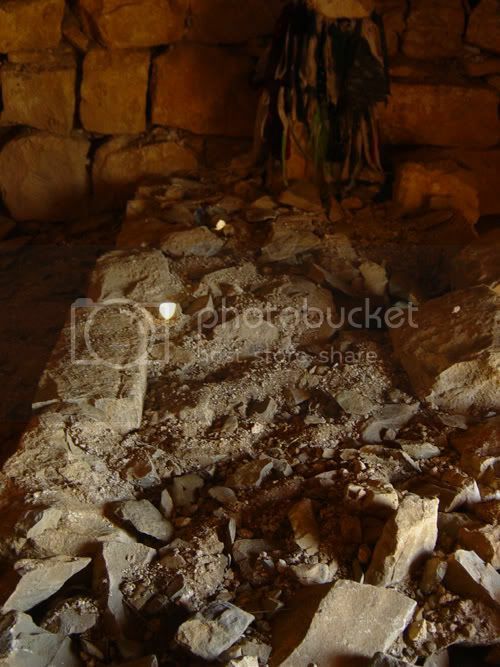 As for the ceremonies of the three faiths at Noah's tomb (actually four--I forgot the Yezidis, who also attended), they are not likely to return soon. Compared to Mount Moriah, the Dome of the Rock, the Western Wall, Al-Aqsa, and the Holy Sepulcher, Noah's shrine is small potatoes, theologically speaking. The author of this profound article ought to be thanked cordially. I absolutely agree with his deductions & qoates from G. Bell & other authors. I searched for the word ,,Kardu"-and this article popped up. I learned that in Peschitta that area or that mountain is called ,,Kardu"-that is a very important information to me. G. Lobjanidze told me in Tbilisi that the mountain called Kardu is mentioned in the middle part of the Coran, but did not specify the text, did not take trouble. I am unable to find that excerpt in Koran, though I searched as I could, the on-line English language Koran. I am especially grateful to the author of this article for exposing the man from California that used techniques to cheat the society with a modern piece of wood, having exposed it to high temperature using the method discribed in books. I did enjoy the photoes old and new and have a feeling as if I also visited that mountain top. I am sure the author is aware that Kardu is also Kardunia-the brilliant kingdom that flourished in that area in the IImillennium BCE. by Natela Popkhadze in the republic of Kardu//Kartu, capital Tbilisi. Also, your "objective" discussion of the facts is tainted by using too-broad a brush in discussing "protestant" ark searchers/researchers. Nevertheless, enjoyed the piece. Natela Popkhadze. I learned only in mid July 2009 that the Aiakartiberian//Georgian//Qartveli historian and linguist Prof. Mose[mose] Janashvili revealed and discussed that the mount Mass//Massis is and was in mid Mesopotamia, while the mount Ararati is a great distance to the north of that Mass//Massis. When the nation of the Aia//Aiacolchian//Aiakolkhian//Kardu//Kordu//Georgian nation//ethnicity established a kingdom in that area, there were no aliens, according to the historical data. These data were distorted since king Vakhtang Vi Bagrationi of Kartli kingdom was ousted by another person supported by an alien army. Ousted king Vakhtang went to the tsar to Moscow and stayed their with his followers. It was there that a distorted histoties were compiled and published in Moscow. The cronicle is called 'Tskhovreba qarTuelta da mefeta matta"//Histori, life of the Kartveli nation and her kings", later shorted to "Qartlis Tskhovreba". Juni Jumber Kakulia has humorously denounced its untikartvelian absurdities, lies; his book is available free at www.georgianhistory.ge in Kartuli//Georgian language. To conclude my commentary, let me repeat once more, that Mass//Massis in ancient texts was in mid Mesopotamia in Tauris mountain range, while Ararat is far north from it. Thus between Massis and Ararat there is a large area first inhabited by the Aians//Kolkhians//Kardu//Kartvelians. As to Rusbrukwuis, I read its English translation on-line recently and was amased at absurdities he wrote(or someone else wrote pretending he was an author) concerning the life of Kardu//Sakartuelo//Kolkheti//Aia of his days. I am sure the part concerning some uncertain king of Armenia (there was no Armenia at that time) is a fake interpolation. This is not a rare trick with the Armenian problem. I did enjoy the firsthand photoes of the mountain area and the building there. Thanks to the author-to Mr. Gordon Taylor. Most readers will never climb that mountain and photoes are an opportunity to see the spot so phamed. Thank yoy, Mr. Gordon Taylor.